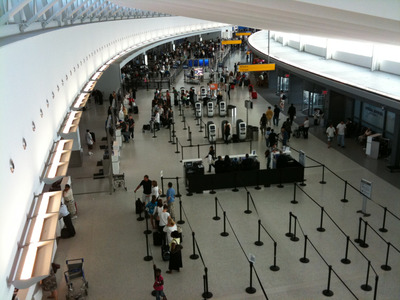 Flickr/Ray WeitzenbergJFK Airport Terminal 5. A water main break at JFK International Airport on Thursday morning stopped travellers from using the restrooms in Terminal 5, according to multiple outlets. A contractor working on the TWA Hotel outside of Terminal 5 struck a water main. A water main break at JFK International Airport on Thursday morning stopped travellers from using the restrooms in Terminal 5. “A contractor was working outside Terminal 5 and struck a water main,” Port Authority of New York and New Jersey senior public information office Alana Calmi told Business Insider in an interview. According to Calmi, the break occurred Thursday morning around 8:30 am. Fortunately, “it didn’t flood the terminal or anything like that,” Calmi added. The water main break disrupted the airport experience for some travellers. JetBlue, Terminal 5’s main tenants, confirmed that all services were back to normal by the afternoon. “Water pressure has been restored at JFK terminal 5 and all services are back to normal following a water main break at the nearby TWA Hotel construction site,” an airline spokesperson told Business Insider in an email. Regardless, some took to social media on Thursday to voice their frustrations at the situation experienced at JFK International Airport on Thursday. You thought modern air travel couldn’t get much worse? Water main break at JFK Airport today means all bathrooms in Terminal 5 closed. Well, that's a sh*tty story.